For Puerto Rico's Universidad del Sagrado Corazón, the process of restoring campus systems after Hurricane Maria led to new opportunities for active learning and community engagement. 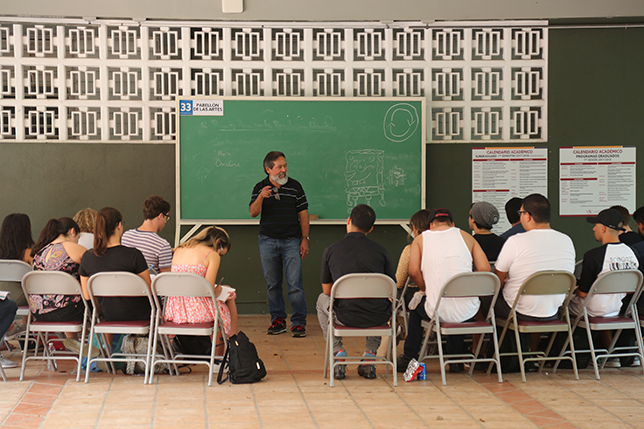 After Hurricane Maria, Universidad del Sagrado Corazón turned every available space into classrooms, including porches, terraces, porticos, open spaces and hallways. 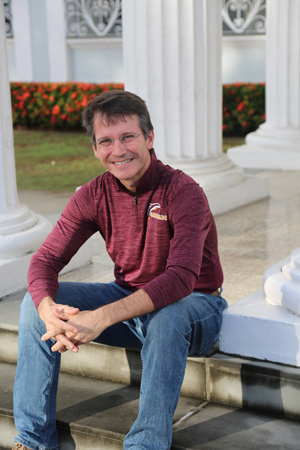 Campus Technology first profiled Universidad del Sagrado Corazón (University of the Sacred Heart) last November as the Puerto Rico-based university recovered from the damage wrought by Hurricane Maria by pivoting to cloud services for delivering its academic and student systems. While that was a worthy achievement in itself with an astounding turnaround time, it's also not the end of the story. What may have even greater impact is how the effects of the hurricane have changed the way learning is now viewed on campus. Maria hit Puerto Rico on Sept. 20, 2017, taking down the power grid and many cell towers. Yet by Monday, Oct. 2, faculty had returned to the Sagrado campus. By Thursday, Oct. 5, administrative staff was back. And by the following Monday, Oct. 11, the doors were reopened for students. 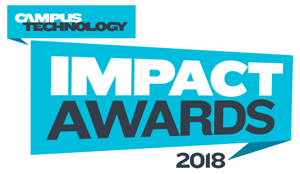 Throughout that time, the university worked with its partner Dynamic Campus to get critical applications and data up and running on Amazon Web Services, including the ERP system, The College Board's PowerFAIDS for financial aid, Moodle for remote and mobile learning, and Microsoft Active Directory for user account management. Conditions weren't ideal, but the university had a few positives going for it, said President Gilberto Marxuach Torrós. First, backup generators were available at the student center, the student residences and a main building where the IT center was housed. Second, the dining hall was powered by gas rather than electricity, which meant the university could cook breakfast and lunch. Third, most campus structures were built in 1906, an era when air conditioning didn't exist and electricity was a rarity. As a result, a lot of the buildings "were designed for natural ventilation and natural illumination," he said. The university took advantage of what it had by turning "every available space" into classrooms, including porches, terraces, porticos, open spaces and hallways. Open tents were also set up to serve as learning spaces. "The classes took place in all of these alternate locations all over campus because our three main classroom buildings did not have backup generators, and therefore we couldn't use them," said Marxuach. The rest of the campus was without power until sometime in early November. And even then, the electrical infrastructure was unreliable, going on and off throughout the day with significant voltage fluctuations. So, Sagrado decided to stick with the alternative classrooms through the remainder of that semester. Amazingly, the university, which is situated on a hill, never lost its cellular connectivity. "Not to say [the signal] was great," cautioned Marxuach. "But it was one of the few places where you could walk around campus with your mobile phone and find a spot where you got a connection and you could speak." Service was intermittent, but people "could speak for a minute or two before the call would drop. "Many people just came to our campus because it could serve as a place where they could get their things in order and plan their days," he noted, "and that was really a great thing to see the community walk through our campus and use us as part of their recovery effort." Cell service wasn't the only way the university helped its community. The basketball court was turned into a distribution center. Dozens of truckloads of goods arrived, and student volunteers would unload, count, inventory, separate and prepare the items for pick-up by community organizations for distribution. Student volunteers helped prepare relief supplies for pick-up by community organizations. About 95 percent of undergraduates returned to Sagrado after the hurricane. But Marxuach estimated that about one in five of those returning students was "really in challenging family or community situations." Some could come back just once a week (or even less often). Being able to provide online access to courses "was a blessing," he said, because that allowed students to continue their classes remotely. While the university had already been piloting the use of asynchronous online course delivery, those efforts took a left turn post-Maria. Faculty Resource Network, New York University and the University of Cincinnati quickly developed an online program that those affected by the hurricane could take free of charge to continue earning credits. The faculty volunteered their time and the universities their infrastructure and expertise for what became known as "Sagrado Online." "This was a great learning opportunity for us, the ability to offer these courses," said Marxuach. "These are interactive, synchronous, online courses as a way to provide flexible access to students." Now the university is in the process of setting up the structures needed for the campus to be able to do this on its own. "It's no longer a pilot. It's going to be part of our academic experience," he noted. This will be particularly important for the many students who ended up fleeing to the mainland. Take the example of Victoria, a student whose family had to evacuate when a nearby river flooded, forcing them to walk out of their home with water up to their necks the evening of the hurricane. Marxuach heard her story while visiting a refugee center where he had gone with a group of nursing students. The team had been there from early in the morning until late at night, and near the end of the long shift, a young woman tapped him on the shoulder and introduced herself as a student at his institution. She explained that her family had lost everything other than their lives. While the university jumped in to fill immediate daily needs, eventually, the family headed to Florida, even as Victoria was determined to complete her semester and continue her studies at Sagrado. Marxuach was clear that the move to the cloud, accomplished in a matter of weeks, made all the difference to students like her. "Even today, a year after the hurricane, families have not come back to Puerto Rico, but they want to complete their education at Sagrado and the only way they can do it is remotely," said Marxuach. "The only reason we were able to do that was because we had our systems up." The student center turned out to become the heart of operations for Sagrado. Because that facility had generator-supplied power, people could charge their phones and other devices, and once the fiber optic cables to the island were repaired, WiFi was available. Just as important, that's where all campus operations ended up. On the first floor was the dining hall and a large gathering area, where students converged. On the second floor was another large open space, where the institution temporarily consolidated operations for its academic departments as well as its academic and student support units. 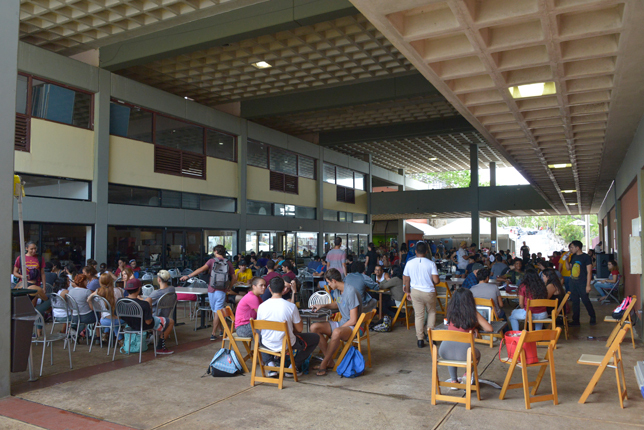 Sagrado's student center provided a gathering place for both students and faculty. "The collaboration, the synergy that developed from everybody being in the same space was really phenomenal. All those departments were together. All the faculty were together. We didn't have any faculty offices. Everybody met in the same place," said Marxuach. "Students would go to one place and everybody was there. You really had the whole university in the student center, which was a powerful image of the mission for our university of student-centeredness and our focus on service for the community." During the subsequent semester, even as everybody returned to their original offices and units, "we're taking seriously into account how we plan our spaces and replicate some of those experiences that really worked well post-Maria," he added. Those makeshift classrooms that dotted the campus forced everybody to sit "at the same level, in the same kind of chair, and you couldn't tell who was the professor and who were the students," Marxuach observed, "They were all at the same level, learning together." Seating wasn't the only thing they had in common, he said. "All of them were living the same reality of the hurricane. They were all going through the same reality in their personal, their family and their community lives. So, there was a sense that all of them were in the same boat, learning from the experience together, and using class as the context for that process of growth and development and social engagement. It was one of the unintended results of this effort. It was not unusual to have students and faculty come and say, 'We ought to continue doing this,' because there was something really special going on in those learning experiences." In these constrained conditions, class became what Marxuach described as "a service learning and community engagement project." Students and faculty went out into their communities to help out. Nursing, psychology and social work students provided services and support, including helping families work through their FEMA public assistance applications. Art and education students took activities to communities to reach kids who weren't in school because so many of the schools in the commonwealth were closed. Journalism, photography and film students documented what they saw. Faculty invited businesses to move onto the campus to continue their operations. "It was really uplifting to see how faculty and the students turned their academic curriculum into a community engagement and social engagement vehicle," marveled Marxuach. 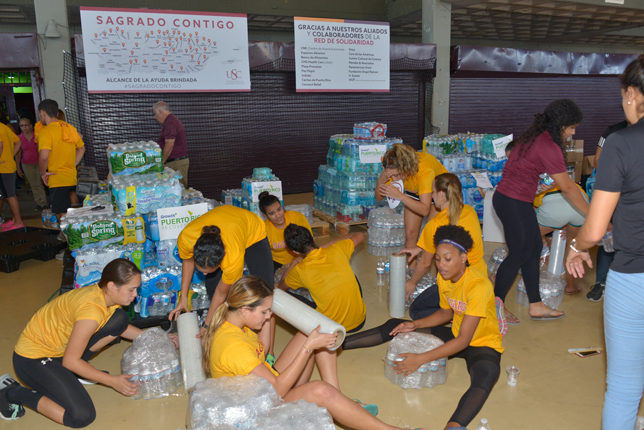 "Everything we did post-Maria at the university, what started as an effort to help the immediate members of our community — students, staff and faculty — evolved into an island-wide solidarity effort. We had 600 to 700 student volunteers; we were part of a network of collaboration with dozens of other entities, nonprofits and community groups; we went directly with our students and our faculty and our staff to 17 towns on 17 missions." Marxuach said that the campus learned a lot from the experience "in terms of things we want to do going forward" — so much so that the university is in the process of an academic redesign to increase "the amount of active, creative community impact learning opportunities for our students." For example, the school is introducing a new "immersion journalism" course to allow students to embed themselves and do reporting from within a community. "We realized how important this kind of [hands-on project] is to meaningful learning, [so] we're going to increase its role within the curriculum," he added. "We want an education where our students are engaged in active and creative learning, that has impact on their communities. And a critical piece is learning together in teams. Everything they will do in life later on will probably be in teams. In this day and age, those teams will be across time zones, across countries, across languages, across cultures. The ability to work together to accomplish objectives, to impact the community for the good, is critical," Marxuach asserted. "The learnings of that experience have allowed us to define much more clearly the path of the university in terms of the kind of education that we want to offer our students."